We envision a community that focuses growth inward in the direction of existing infrastructure, neighborhoods and public services to reduce our contribution to climate change and prepare us for its impacts. Our community will develop infrastructure and new growth that is sustainable, adaptable, and in the direction of existing services. 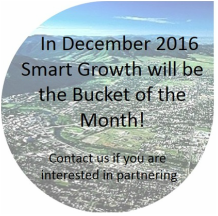 Have you heard of our Smart Growth - Smart Transportation project? Click here. Develop parking with improved access/synergy to biking, walking, bus, etc. The Missoula City Council passed the Our Missoula Growth Policy in fall 2015. Find out more here. "Our Missoula" will determine how Missoula develops in the realms of community design, economic health, environmental quality, housing, livability, and wellness. Read more about smart growth more generally.